Seven small satellites to serve organizations on four continents rocketed out of a missile silo in Russia and roared into orbit Wednesday on top of a Dnepr rocket. The Dnepr rocket blasted off from an underground missile silo in southern Russia. 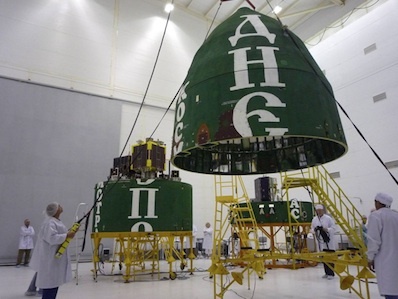 The international payloads blasted off at 0712 GMT (3:12 a.m. EDT) from a space base near Yasny, Russia, a small community in the Orenburg region in the southern part of the country. The 111-foot-tall Dnepr rocket shot out of an underground silo, ignited its first stage and soared into a sun-synchronous orbit more than 400 miles high. Powered by surplus Soviet-era military ballistic missile stages, the Dnepr rocket reached orbit a few minutes later and deployed seven small satellites for Nigeria, Ukraine, Turkey, Italy and the United States. Two spacecraft manufactured by Surrey Satellite Technology Ltd. for Nigeria were aboard the Dnepr rocket. Both satellites were successfully contacted after the launch via ground stations in Nigeria and the United Kingdom, according to SSTL. Based in Guildford in the United Kingdom and owned by EADS Astrium, SSTL built NigeriaSat 2 and NigeriaSat X for the National Space Research and Development Agency, the Nigerian space agency. "This is a great day for the Nigerian space industry and builds on the success of NigeriaSat 1, launched in 2003," said S.O. Mohammed, head of NASRDA. "NigeriaSat 2 will significantly boost African capabilities for remote sensing applications, specifically for natural resource management. This high resolution satellite will also greatly enhance image data available to the Disaster Monitoring Constellation." 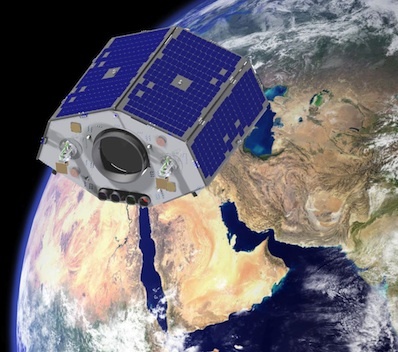 The satellites will join the Disaster Monitoring Constellation, a network of lightweight orbiting spacecraft built by SSTL designed to assist with disaster relief and track environmental changes around the world. "The completion of this significant engineering project is testament to the success of the rapidly growing UK space industry," said David Willetts, the UK science minister. "Not only are we producing technology and services that are in global demand but we are also helping more countries use satellite imagery to tackle important issues, including urban development and disaster relief." NigeriaSat 2, which weighed approximately 600 pounds at launch, will provide high resoultion maps of Nigerian territory, monitor Nigerian crops to ensure the security of the nation's food supply. The craft's imager will snap photos with a resolution of 8.2 feet, sharp enough to spot roads, homes, fields and keep track of floods, droughts, earthquakes and other natural disasters. Imagery from NigeriaSat 2 will also contribute to urban planning in Nigeria, Africa's most populated country. NigeriaSat X was built under a three-year training program between SSTL and Nigeria. More than two dozen Nigerian engineers helped construct and test the 220-pound Earth observation spacecraft at SSTL headquarters. "Through a comprehensive training program, Nigerian engineers have worked on the design and build of NigeriaSat X, benefiting Nigeria's growing space industry and inspiring development of new technologies," Mohammed said. 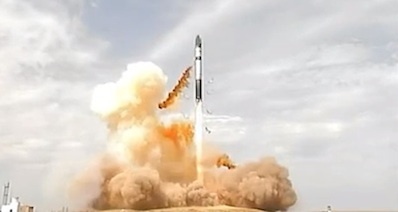 Ukraine's Sich 2 remote sensing satellite was also launched on the Dnepr rocket. Built by Yuzhnoye, a leading Ukrainian aerospace contractor, Sich 2 will obtain medium-resolution images of Earth during its mission of at least five years. Such imaging products will be useful in monitoring the environment and land use planning. The Dnepr rocket also hauled into orbit RASAT, the first Earth observation satellite designed and built in Turkey. The 205-pound RASAT payload features a camera capable of a peak resolution of about 25 feet from the craft's 430-mile-high orbit. Owned by the publicly-funded Space Technologies Research Institute, RASAT is designed for a three-year life in space. Its primary objectives are to advance Turkish space technology and know-how and observe natural and manmade disasters, monitor coastline changes and pollution, detect illegal settlements and urban land changes, and update existing maps. The University of Rome's EduSat microsatellite and two U.S.-built AprizeSat asset tracking satellites, each weighing about 25 pounds, also rode the Dnepr launcher into space Wednesday.